We were drawing a correlation with your SUPER BODY, SUPER BRAIN and Other “multi-joint” exercise, such as Tai Chi, Which scientists use to help restore some memory Functioning in Alzheimer’s and dementia patients. And I asked, although your program hasn’t been Clinically tested, if it could produce the same effect in the brain, like Tai Chi. and he said yes, in fact, your program may be even better because the exercises are more complex…. But it wasn’t enough to know the change was there. Gonzalez-Wallace wanted to know why. “When I started seeing these unusual results, I found that no matter how much I was reading, I needed a professional opinion,” says the trainer. 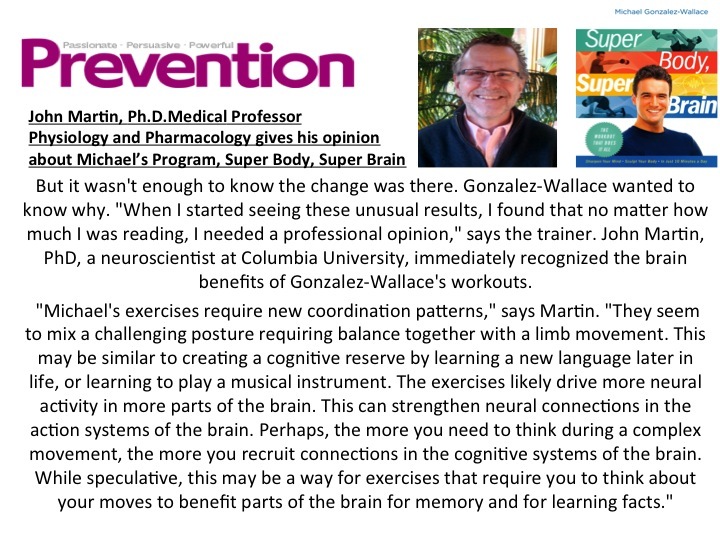 John Martin, PhD, a neuroscientist at Columbia University, immediately recognized the brain benefits of Gonzalez-Wallace’s workouts. When Gonzalez-Wallace was developing the workout, he talked it over with Jack Martin, a neurobiologist at Columbia University. Martin thought it made sense. Brain activity is more limited for motor tasks produced without much thought compared with movement that has to be coordinated on the fly, he said. “Some of Michael’s exercises require new coordination patterns; odd combinations of movements that people don’t normally do. Like mixing a challenging posture requiring balance together with a leg movement,” Martin said in e-mail. “Getting more of the brain to work to produce a complex movement is plausibly beneficial for overall brain function. Maybe it is the motor equivalent of building a cognitive reserve by learning to play the cello at 55 years old or doing crossword puzzles. 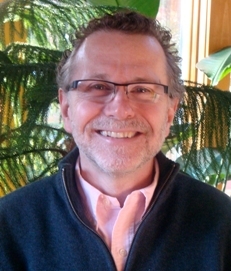 GREG LOMBARDO, MD, PH.D. is a child psychiatrist in private practice in Manhattan and Westchester county. 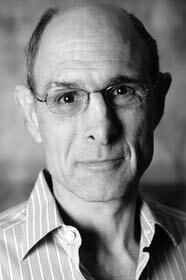 He is board certified in adult, child and adolescent psychiatry and is a diplomate of the American Society of Clinical Psychopharmacology. The more I work with bipolar children the more I see difficulties which some of them face that have nothing to do with mood or behavior but profoundly influence both. Bipolar disorder is a condition affecting the entire brain and most importantly the coordination of different parts of the brain. -Problems with reading and handwriting have to do with poor integration of left and right visual motor activity. These fundamentally neurological problems are not captured in current descriptions of bipolar disorder, and they are not remedied by competent use of psychotherapy. A NEW FORM OF PHYSICAL EXERCISE HAS COME TO MY ATTENTION THAT WORKS TO TREAT THESE PROBLEMS. This is a from of physical training that combines balance and coordination in the same movement maximizing brain activity at the time of performing challenging physical movements. The program is designed to advance gradually so that a child imperceptible learns to perform more and more complex exercises. As integration of movement and balance improve powers of concentration and attention improve as well. The body leads the mind toward better coordination, focus and ability to attend complex tasks. Such resource is particularly valuable for children who cannot tolerate medicines used to treat ADD and for children whose awkwardness tends to isolate them from group activities. Children without these deficits also Benefit from this training but usually begin at and proceed to a higher level of accomplishment. However, the program is designed to focus on each child’s progress without comparison to other children. 4. – An improvement in their perception of their body and their body related to space. A child needs to practice this program several times a week to gain benefits, making participation greater for the overscheduled child and parent. The program is also designed and taught with humor encouraging the child to have fun while obtaining mastery. -During adolescence a pruning process occurs during which those parts of the brain that are not actively used are removed: what you don’t use you lose. I have been Michael’s student and I am impressed not only with subtlety of his teaching but also its patience and humor. This section has been reviewed by Dr GREG LOMBARDO, MD, PH.D. is a child psychiatrist in private practice in Manhattan and Westchester county. He is board certified in adult, child and adolescent psychiatry and is a diplomate of the American Society of Clinical Psychopharmacology. Michael has created and tested SUPER BODY, SUPER BRAIN exercises to stimulate our brain to be plastic, ready to respond to stress, to new demands and to aging. The most important message of Michaels’ book is that with ten minutes, you can have a healthy body that, in turn, can produce and sustain a healthy mind. Motor skills refers to the abilities which involve the use of hands, develop over time, starting with primitive gestures such as grabbing at objects to more precise activities that involve precise hand-eye coordination. Fine motor skills are skills that involve a refined use of the small muscles controlling the hand, fingers, and thumb. The development of these skills allows one to be able to complete tasks such as writing, drawing, and buttoning. Improving children’s brain functioning through specific exercise movements. Regarding brain functioning, it is important to refer to the cerebellum, the area of the brain responsible for voluntary physical movement is connected by neurons to all parts of the cortex, the area of the brain responsible for higher order thinking. Nearly 80 studies have suggested a strong link between the movement and memory, spatial perception, language, attention, emotion, nonverbal cues, and decision-making (Jensen, 1998). A number of studies also indicate that children suffering from even subtle forms of Bipolar Disorder have difficulties integrating the cognitive function of the left with the right hemisphere. This is also thought to be true for children with dyslexia and dysgraphia, conditions that powerfully affect a child’s scholastic function and their self-esteem. An essential feature of SUPER BODY, SUPER BRAIN is to improve the integration of motor activity carried on between the left and right hemisphere. This cannot help but improve problems with visual integration and with fine motor coordination and sensory-motor coordination, yielding improvement is some children’s reading and writing (both in the sense of handwriting and in the sense of composition). Cardiovascular benefits seen with any regular aerobic exercise are particularly important in school age children. Among children Type II Diabetes caused by decreased physical activity and poor nutrition leading to obesity has reached epidemic proportions. When a child experiences improper weight gain (because of larger amounts of circulating growth hormone) the child increases the number of fat cells rather than their size (as is the case with adults). Consequently, hyper-cellular obesity is especially hard to reverse later on in life. According to Dr. Lombardo, “Play is an activity that’s found in all intelligent creatures, including some animals. It’s fundamentally related to learning; you’ll watch dogs play at things that they later have to learn. In humans, play usually has an underlying unconscious goal. For example, ‘catch’ is about connection, so I often play catch with children who have problems with separation. Tennis is ‘catch’ wedded to aggression. And when you put opposite things together like that, the energy involved in the pleasure increases. “Play always has techniques, or rules. The rules in some sense oppose the end of the play, but they also create tension and structure. This tension is the play of play–the play between this and that. And play also tends to have an aesthetic quality, because when you engage in it for its own sake, it doesn’t just provides fun but a tendency toward grace and beauty. “Super Body, Super Brain exercises do all that. There are certain basic exercises that you learn first, and then as you master the techniques your movements become smoother, you add things to them, and it becomes something more than simply exercise. It becomes fun. And the audience is still very important—because the audience is you! The Super Body, Super Brain exercises advance gradually, so that children imperceptibly learn to perform more and more complex exercises. As integration of movement and balance improve, their powers of concentration and attention improve as well. Improved motor skills, balance, and coordination are particularly important for bipolar children, as well as those with ADD, as they tend to be awkward, bullied, and isolated from group activities. They can do these exercises freed from any comparison to other children, as they’re only competing with themselves. And because the exercises are fun, children don’t see them as a chore, and improve their skills without even realizing it. 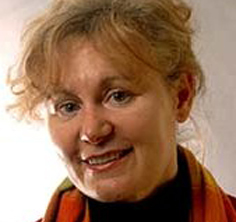 This section has been reviewed and endorsed by Gregory T. Lombardo MD, PhD, Adult, Child and Adolescent psychiatrist; author Understanding the Mind of Your Bipolar Child, St. Martins 11/2006; doctor of English and Comparative Literature, Columbia University; and former teacher of writing and English literature at Columbia College and at The Trinity School N.Y.C. “The enthusiasm of Michael pervades the reader and encourages to actually execute the proposed exercises. Many ideas are based in the well-known dual-task paradigm. It is clear that performing dual-tasks, such as walking with fins and performing mathematical operations simultaneously, has a clear impact on the performance of one orboth of them. And, more importantly, it is clear that the more complex the task, the more brain areas are involved. This suggests that the idea of including SUPER BODY, SUPER BRAIN complex exercises or even composition of exercises really require more brain activity. Some of the ideas are beyond scientific proof yet, however, they sound plausible and they merit a detailed scientific testing. The Governor of Minnesota, Tim Pawlenty and Mayor of St Paul, MN Chris Coleman award fitness trainer Michael Gonzalez-Wallace for his exercise program “Super Body, Super Brain”. 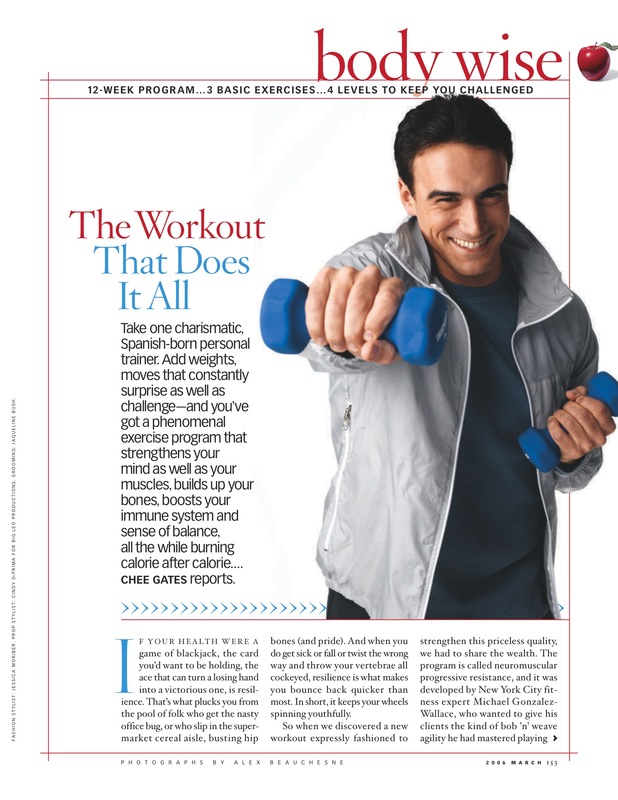 Michael Gonzalez-Wallace has developed an innovative exercise program that is presented to a vast audience of viewers and readers throughout USA. “The very talented, intelligent, and exercise specialist Michael Gonzalez-Wallace has produced a book that is likely to change the entire field of physical fitness. In this immensely readable book SUPER BODY, SUPER BRAIN: THE WORKOUT THAT DOES IT ALL he has taken advantage of his experiences as an athlete in Spain, his studies in the ‘science’ of economics, and his communication and close relationships with neuroscientists, neurologists, psychiatrists, nutritionists and his personal achievement of becoming a Certified Professional Trainer from the National Academy of Sports Medicine and years as a personal trainer, and has designed and written the new ‘bible’ for physical fitness! What makes Gonzalez-Wallace’s book so very different from the many other excellent fitness books is his inclusion of aspects of brain function as tied to motor function. He begins his book with a very sound explanation of the interaction of brain function with motor function and after explaining much data few of us knew he begins his exercises models, explaining how minimal work physically can simultaneously stimulate the brain to use different areas, the result being a workout for the brain that makes us more coordinated, alert, retain more memory, and master multi-tasking abilities that carry over into our daily routines. And most interesting, he shows us how that all of this body and brain conditioning can take as little time as 10 minutes per day (giving us options to increase the activity and thus the results in similar painless ways). As a physical therapist, I often see exercises and attention that are too focused on just one isolated body part or muscle. This does not truly reflect our natural movement patterns in life and it inhibits a patient’s progress with their rehabilitation. Super Body Super Brain incorporates whole body movements as well as involving our neurological “circuits” by challenging our balance, our coordination, our attention, and our mood! By integrating so many different movement patterns, more is accomplished in less time and there is no need for a large space or expensive equipment. These exercises are ideal for so many of my patients who are trying to fit exercise into their busy lives. “Occasionally there comes along an individual without formal medical training who intuitively develops a technique or self-help activity that has a significant impact in the health field. I would offer the name of Michael Gonzalez Wallace in this context. Appropriately he refers to his exercise technique as “SUPER BODY, SUPER BRAIN” This, as the name implies, involves exercise of all the major muscle groups while slowly increasing the complexity of the work-out to keep the Brain engaged. Balance challenges too are added features of the exercise workout. This is important in patients with diseases like Parkinson’s because it is a dangerous symptom that does not respond well to medication but can be helped by exercise. While many exercise programs have included some of these elements the programs included with Michael’s technique engages the subject fully even in the beginner’s tapes. As one who works with individuals who have autism spectrum disorders, I know first hand the importance of the neuro-biological circuitry that is so often overlooked. Exercise is important for our physical health, but equally if not more importantly, Michael Gonzalez-Wallace clearly shows that his targeted workouts have an incredible effect on neurological functioning and improvement of brain function as a whole in SUPER BODY, SUPER BRAIN. Michael Gonzalez-Wallace has incorporated some of the best and latest neurological research in creating these specific exercises that not only target peak physical performance, but incredible improvements in brain functioning. This translates to improved cognition, neurological functioning, focus and attention, balance, sensory processing, memory enhancement, behavior improvement and much more! * Degenerative Functioning of any Type – Whether it be nursing homes dealing with typical aging or degenerative disorders such as Alzheimer’s, hospitals and rehabilitation clinics, psychiatric institutions, etc. I’m confident you will find, as I did, that this book is a must for any reader serious about improving their physical health and brain functioning. This is the first time someone has created a program, which taps into how complex circuits in our brains connect to our muscles through voluntary and intentional movement. Huge implication for aging. 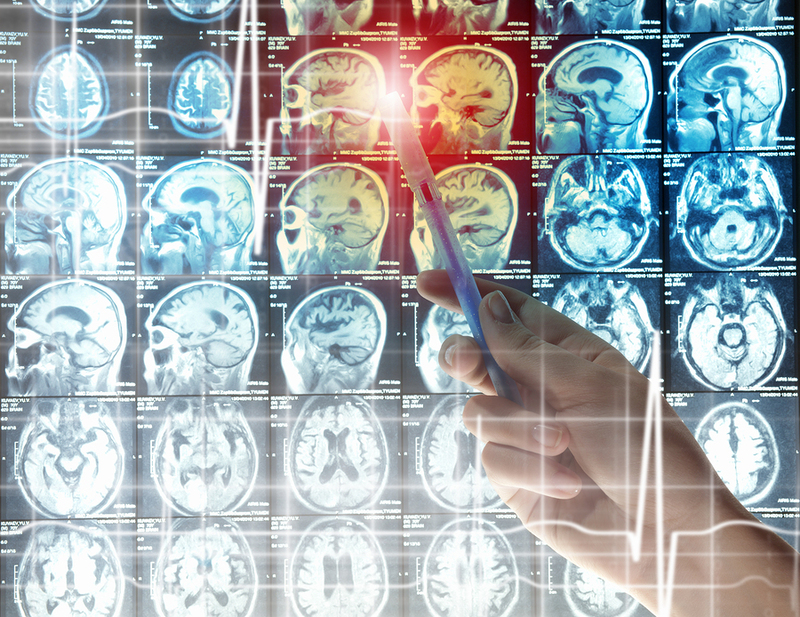 For more than a century, medical science firmly believed that our brain could not repair itself and that we were born with all the brain cells we would ever have. In SUPER BODY, SUPER BRAIN he provides compelling evidence that exercise is not only good for your heart, but also good for your brain. He aptly demonstrates an exciting daily fitness program that stimulates your brain cells during your workout. He shows you how to work out smarter, instead of longer. As someone who has specialized in medical/health for over two decades, I strongly endorse Michael’s program. When you first learn of it, you’ll think it must be a gimmick. It’s not. As mentioned, it’s based on decades of scientific research. I use the program myself and have known Michael for years. He’s the real deal; extremely passionate about the program because he knows it works and can help others improve their energy level and entire well being from the inside out. In today’s ever-competitive world, it’s not enough to have a Super Body. You absolutely need a Super Brain. Michael shows you how to build both at the same time. The benefits of his unique program are long overdue within the entire health community. Super Body Super Brain by Michael Gonzalez Wallace is definitely the future of fitness. Everyone at any fitness level from beginner to pro will take something away from this book that improves his or her health. The author sets out a number of important goals early in the volume. There is an extensive section which describes the functioning of the brain. The brain may be rewired during learning by developing new synapses called neuroplasticity or adaptation. Aerobic exercises increase the brain derived neurotropic factor – a protein that promotes the growth of neurons. When nerve connections get thicker, there is a quickening of reasoning. Exercise releases endorphins or the classic runners’ high. Acupuncture is a known modality for utilizing endorphins to help relieve chronic pain. WOW – This is great stuff, we are looking forward to implimenting this into our sr./elder care programs!